What book would you recommend for non-statistician scientists? What book would you recommend for scientists who are not statisticians? Clear delivery is most appreciated. As well as the explanation of the appropriate techniques and methods for typical tasks: time series analysis, presentation and aggregation of large data sets. As an undergraduate studying philosophy, I was asked to analyze some data for a small study that I was working on with a physician. Needless to say, I found myself somewhat overwhelmed, but was able to get by by mimicking some old Stata code that a biostatistician friend had given me. The analysis turned out to be good enough to help get the study published, and I had suddenly become interested in this curious field of study called statistics. 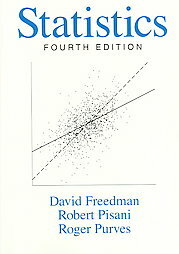 The first book on statistics that I read was Statistics, by David Freedman and colleagues. What I liked most about it was its focus on explaining the fundamental concepts of statistical analysis (what do p-values actually mean, why is it important to visualize data, what does it mean for a test to be significant, etc) with concise and accurate language, but without too much mathematics. With that conceptual background, I found it much easier to go on to read more advanced literature with more advanced mathematics. This book covers all topics covered in a first year statistics course, but does not cover time series or aggregation of large data sets. I feel it does a very good job at teaching a non-statistician how to think like a statistician. From there, adding new methods, like time series, should be relatively easy, and the non-statistician should be well on his way to becoming a life-long student of statistics. The answer would most definitely depend on their discipline, the methods/techniques that they would like to learn and their existing mathematical/statistical abilities. For example, economists/social scientists who want to learn about cutting edge empirical econometrics could read Angrist and Pischke's Mostly Harmless Econometrics. This is a non-technical book covering the "natural experimental revolution" in economics. The book only presupposes that they know what regression is. But I think the best book on applied regression is Gelman and Hill's Data Analysis Using Regression and Multilevel/Hierarchical Models. This covers basic regression, multilevel regression, and Bayesian methods in a clear and intuitive way. It would be good for any scientist with a basic background in statistics. Peter Dalgaard's Introductory Statistics with R is a great book for some introductory statistics with a focus on the R software for data analysis. The Statistical Sleuth (Ramsey, Schafer) which contain a good deal of mini case studies as they cover the basic statistical tools for data analysis. A First Course in Multivariate Statistics (Flury) which covers the essential statistics required for data mining and the like. A lot of Social Science / Psychology students with minimal mathematical background like Andy Field's book: Discovering Statistics Using SPSS. He also has a website that shares a lot of material. Not intending to plug my book but it does seem to possibly apply. Last year I published a book with Wiley titled "The Essentials of Biostatistics for Physicians, Nurses and Clinicians". It is paperback and fairly concise 214 pages in total. It has the advantage for you that it emphasizes topics that are important in biological applications but may not be quite as concise as you would like to have for a 10 day self-learning course. "Introductory Statistics for Biology Students" 2nd Edtion by Trudy Watt and published by Chapman and Hall/CRC 1997 is another paperback that might be right for you. It is a little simpler than my book but does not include survival analysis which I consider to be a very important topic in biological studies (particularly clinical trials). Her book is 236 pages. I would also like to mention "The Cartoon Guide to Statistics" by Gonick. A humorous book but it also covers basic concepts very well and is exceptionally easy to read. Statistics in Plain English is pretty good. 4.5 on Amazon, 11 reviews. Explains ANOVA pretty well too. The Drunkard's Walk: How Randomness Rules Our Lives by Leonard Mlodinow is an excellent book for laypeople. Enjoyable and educational. It might not be a textbook, but it makes you think about the world in the right way. to be an excellent introduction. It was how I first learned about statistics from a conceptual point of view. As a first introduction to the topic i liked Data Analysis: A Bayesian Tutorial. For a deep and philosophical discussion of the underlying ideas of quantitative scientific reasoning i recommend Probability Theory: The Logic of Science. This book does not serve as a good introduction, though. It's only recommended for persons who want to know, why bayesian statistics is the way it is and/or are interested in a historic review of bayesian statistics. The Flaw of Averages by Sam Savage. So many wonderful recommendations! It's not quite what you asked for, but How to Lie with Statistics is short and quite wonderful. It doesn't directly teach the things you want, but it does help point out violation of assumptions and other flaws. NB these are orthogonal - there are lots of statistics experts who are terrible at data visualisation, and vice versa. The following are text books I used for my MSEE coursework and research and I found them to be pretty good. Probability, Statistics and Random Processes for Engineers by Henry Stark and John W. Woods (Detailed explanation of concepts, good for Communications and Signal Processing people). Schaum's Outline of Probability, Random Variables and Random Processes by Hwei Hsu (Concise explanation of concepts, has a good amount of solved examples). I recently found Even You Can Learn Statistics to be pretty useful. "How to Tell the Liars from the Statisticians" by Hooke. I am fond of its way of explaining the concepts of statistics to laypersons. As for explaining the motivations of statisticians, "The Lady Tasting Tea" is good reading. I strongly recommend "Statistics for Experimenters: Design, Innovation, and Discovery , 2nd Edition" by Box, Hunter and Hunter. Must-read book for any scientist doing statistical analysis of their experiments. There's a companion R package (BHH2) as well. For years I have found the Engineering Statistics Handbook to be useful on a practical level. It's geared towards "Outdoor Science" (Ecology, Environmental Science, Biology) but the pedagogy is excellent. Anyone could benefit from it. I have recently had this website pointed out to me. It covers a number of books useful for new statisticians, with some targetted discussion of their various strengths and weaknesses, and a summary right at the bottom. 1st Edition., 2010, XVII, 538 p.
I would recommend: The statistical sleuth (Ramsey&Schafer) and biostatistical analysis (Zar). I'm really fond of the "for Dummies" series, and from the few pages I've read of it, Deborah J. Rumsey's "Statistics For Dummies" is a fine book for non-statisticians as well as Statisticians looking for a way to explain statistical concepts to non-statisticians. This link suggested many great books. besides that, I suggested: The Statistical Sleuth: A Course in Methods of Data Analysis. Following the examples in the book, many concepts become easier to understand. Whitlock and Schluter The Analysis of Biological Data https://www.amazon.com/The-Analysis-of-Biological-Data/dp/1936221489 is an outstanding blend of statistics and science. You don't have to be a biologist (I'm certainly not) to understand and appreciate the examples. It's not only clear and sound, it's entertaining and enjoyable too. If you're to use SPSS, I'd recommend this book: Data Analysis for the Behavioral Sciences Using SPSS by Weinberg & Abramowitz. It is very well written and accessible. Note that it doesn't cover time-series, though. Here are two best-selling primers, written for a general scientific audience, using a minimum of formulas and emphasizing a conceptual approach. Each book explains a variety of methods that commonly are used in academic articles and reports. Each chapter explains the purposes, assumptions, and major concepts of a given method, and then illustrates the method using an easy-to-understand example drawn from the literature. Both books are available in most college libraries. What are some introductions to classical statistics that emphasize unifying principles? What book is recommendable to start learning statistics using R at the same time? Best books for an introduction to statistical data analysis? Any suggestions for a good undergraduate introductory textbook to statistics? The reference book for statistics with R – does it exist and what should it contain? What statistical blogs would you recommend? Recommend e-book that is comparable to Hamilton's Time Series Analysis? What is the most beginner-friendly book for information geometry? Unit Roots For Dummies book?